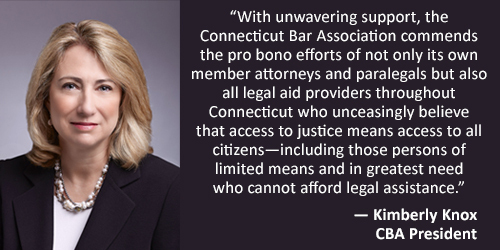 Welcome to CTLawHelp's Pro Bono Portal, Connecticut's one-stop resource for pro bono attorneys who would like to provide free legal assistance to people with very low income. Browse our catalog to connect with the right opportunity to share your time and skills. 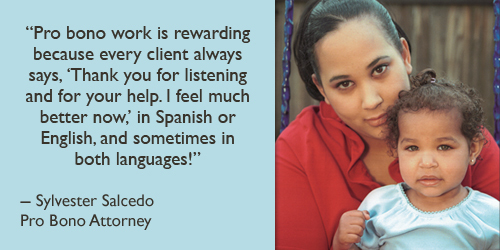 Contact us to share a positive pro bono experience, or to suggest resources that you would like to see on the site. And don't forget to check back often, as we will be adding new training materials and features to support volunteer attorneys. Our latest addition: free online classes for volunteer attorneys. Thanks for visiting, and thanks for giving back. For every pro bono case I take, I undermine one more attorney joke. I can keep my paying clients while holding on to my dream of making a difference in my community. God probably won't care if I am "this close" to a billable hours bonus. My kids will think I'm cool. I don't get a pass on something this important just because I am busy. Pro bono keeps me in touch with my inner Atticus Finch. Saving a child or even a family is a life changing experience I will always remember. Doing pro bono work recharges my batteries. Attorneys who do pro bono say it makes them better attorneys. 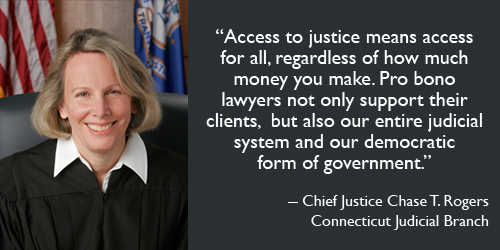 Because the Rules of Professional Conduct say all lawyers should work to ensure equal access to justice for all those who cannot afford counsel. Help support a great cause while having fun!